I've been going to the same medical clinic for our family's needs for over 18 years, so the staff know us pretty well. Our doctor and his long-time nurse especially have followed our family from the time I was expecting my first child, through all my subsequent pregnancies, kids' bouts with RSV and croup, and so much more. As a result, Dr. S and Nurse T have followed my writing career from almost the beginning, when I liked to write and tried to get publish, along the bumpy road of lots of rejections to finally being accepted, and today they always ask what's coming out next and when. The last time we saw Nurse T, she asked something different that has stuck with me, and I realized it's a question many readers may have, so I thought it worth addressing in a post here. Paraphrasing her, she asked, "Isn't it hard to find new things to write about so you're not copying other writers?" She added that it's probably hard to ever read much, because of the fear of copying someone else's style or story. Is reading a danger for writers? And is it hard to find new ideas? The short answer: No and no. The longer one: Writers by their nature tend to be curious people. We see a news report about a natural disaster and picture the victims or even put ourselves into the situation and wonder how we'd deal with it. We hear about a horrible crime and wonder what made the criminal do it, and what the victim was thinking. We get story and character ideas from places like songs, newspaper advice columns, and old cemeteries (check, check, and check on each of those for me). So no, writers generally don't worry too much about being totally original. We're always seeing the world in new and interesting ways, and almost by definition, our perspective is original. On the other side, there's the old saying that there are no new stories, just new ways of telling them. That is what a good writer tries to go after: telling a story, familiar or not, in a new, fresh way. Think of how many great fairy tale re-tellings there are today. Take that number and multiply it by all the writers and stories out there. The real meat of the issue is this: Nurse T was wrong in assuming that reading will cause a writer to be unoriginal, because the exact opposite is true. Turns out that writers who don't read much are the ones who end up writing the same old hackneyed plots that have been done to death. I've seen such writers pump out book after book, not realizing that not only are their books cliche, but they're basically writing the same book over and over again. They write cliched characters and worlds and conflicts. These writers are missing out on an amazing universe of creativity that's out there for the taking. It's almost as if the universe has layers of cool fiction, and we all tap into it on some level, and that the deeper you go, the broader the options become. So the more you open your mind to literature, the deeper into those layers you travel, and the broader your potential scope for story fodder. Stay in the shallow areas, and you've been where every other writer has waded at some point: in the totally unoriginal, cliched mass of washed-up stories. I've also seen how reading a lot can teach a writer what has been done before, and that means both what's been done well, and what's been done poorly. A young fantasy writer unfamiliar with the tropes of the genre is far more likely to do a veiled copy of Tolkein (trolls and dwarves and elves!) than someone who's been reading a wide range of fantasy for years. It may sound counter intuitive, but the more literature you read, the more you fill your mind and imagination with images and ideas, and therefore the more likely your brain is to come up with brand new possibilities to throw together. It's like taking apart several cool Lego creations and then dumping the pieces into a bag, shaking them up, and then removing the blocks one at a time to make something new. Sure, the blocks all came from other sources, but your creation is totally different and fresh. So to answer Nurse T (I didn't give her this long of an answer at the time; I swear), I don't worry about copying other writers. Not at all. I worry about plateauing in my skill, about not out-doing myself with my next work. I worry about not staying fresh, about not reading enough, especially of the really good stuff out there, because I know good literature will get into my subconscious and make me a better writer. Even when I read a book with my writer/edit hat on, it's a fantastic thing. I can read a powerful scene and analyze it: Why is this scene so effective? How did the author create that effect? What can I learn? Did you read a book that knocked your socks off? Can you figure out why it knocked your socks off? I remember my good friend Heather Moore saying that every time she reads Anne Perry, she notices an improvement in the quality of her own descriptions. I don't know too many writers who are so keenly aware of the effects of their reading, but whether you notice them or not, the effects are there. Even reading bad books can be useful, so long as you use them as lessons to learn why a book isn't good, what the writer did wrong. And so long as bad books are the minority of what you read. The fact is, writing is part talent, part art, and part science. Plus a bit of luck thrown into the mix. It's not some ethereal, unknowable thing (although I admit that it feels magical at times). I could add a lot of other things to the list: study the craft, attend writers conferences, find a critique group and other trusted readers. And all of those are important; all of those things can help immensely. But those two things--reading and writing--are the ones everything else hangs on. They are the cornerstones your writing house is built on. As Stephen King has said, if you don't have time to read, you don't have time to be a good writer. I'd add that if you do have time to read a lot, then as long as you're also writing a lot, you're on your way to being a better writer. Not the kind that copies or create cliches. I'm part of Timeless Romance Anthologies, along with Heather Moore and Sarah Eden. Three or four times a year, we'll be putting out novellas with sweet (meaning clean) romance novellas as e-books. We hand pick three other writers for each collection. The result is that for under four dollars, you get a book the size of a regular novel with six great stories. 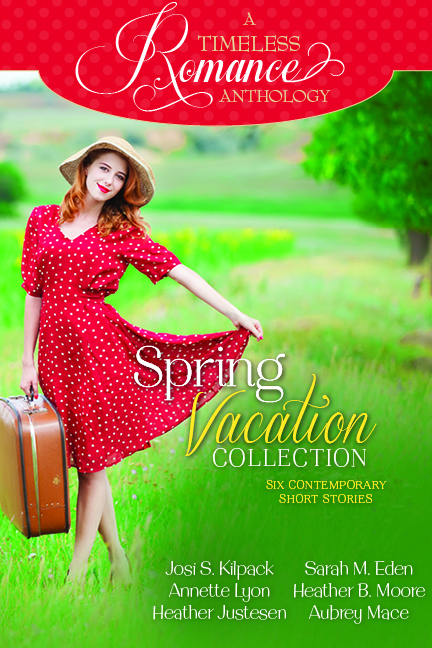 The Winter Collection went live last fall (filled with great historical romances set in the winter), and the Spring Vacation Collection (featuring contemporary romances all with a spring vacation theme) debuts on February 1st. It's been a blast to be part of the anthologies. The first one got rave reviews, and we look forward to putting out more of them. Watch for Spring Vacation Collection in a couple of weeks, and then the Summer Wedding Collection a few months after that. To keep up to date with the anthologies, be sure to like our Facebook page. Note that if you haven't read the first book, you can read this one without being totally confused. I purposely reintroduced the wives, particularly because it's been almost three years between books, so even readers who know the first one may not remember all of the wives clearly. Plus, there's a handy reference page at the front, where the wives are listed by age with their husbands' and children's names. If you read Coming Home first, you will learn much of how the first book ended. Not a crisis, by any means. You really can start with this one. 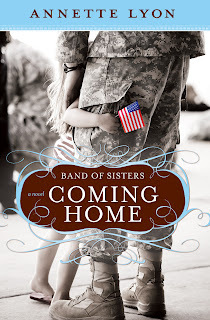 I don't know of any plans to put the first book into another printing, but Band of Sisters is available as an e-book, for about $5 below the print version. The Newport Ladies Book Club is moving forward with the second set of books coming out this year. The only title that has a firm release date so far is Shannon, by Josi S. Kilpack, which will hit shelves in May. My contribution, Ilana, has officially been accepted, as has Heather's Ruby. Julie Wright's Tori should be official soon, and shortly after than we should have the release dates lined up. One book may be released earlier than Shannon; we don't know for sure yet. To keep up with the series, be sure to check the Newport blog (link below) or like the series Facebook page. We plan to do a final reunion book after all eight novels are out, a volume where all eight book club ladies come together so readers can find out what happened to them. I know a lot of readers want to know about Paige's future; I can't wait to tell you all! Along the same lines, The Deseret News recently interviewed the Newport Ladies authors and published a feature article about the series in both their print and online editions. Be sure to read the blog post Heather did about the experience as well as the actual article. I agree that reading is huge for a writer. If you gave a group of writers the same basic character and plot to write a book on, they would write vastly different books. When I read something, it will often spark an idea, but the outcome from that idea could be light years away. You make some great points here. And frankly, I don't see how anyone becomes a writer without reading voraciously! Amen to "good writers are good readers." When I'm not reading, I find I'm not happy with my writing. Time to read a good book before I open that file. Excellent post, Annette! When I hear that a writer doesn't like to read, I automatically don't want to read their books for the exact reasons you stated. Annette, you are spot on!I love to read the NY Times Best Seller lists to see what the greater public is reading. I google the prize winning authors to see why they warranted their recognition. if you don't read, you don't live. Great post, Annette! Now, back to more reading.